PRODUCT DESCRIPTION: The Double Nozzle attachment replaces your current nozzle and features two nozzles which are fan spraying. 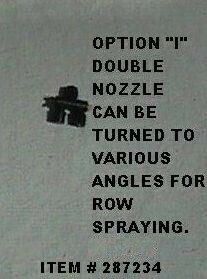 These nozzles can be rotated around so they spray in just about any direction imaginable. This attachment is great for when you need to spray in opposite directions. Such an application could be needed when spraying down a row of plants where you have multiple rows planted. Instead of having to make a pass for each row, you will be able to treat two rows with just one pass. 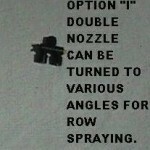 The nozzles included are fully compatible with any of the other nozzles included with your sprayer so you can change them as desired.